Synthetic additives, like partially and fully hydrogenated oils (transfats) and artificial colors, are not used as ingredients. People are experiencing better health after eating organic foods and voting with their dollar for foods that nourish their bodies. But I still hear people say that they can’t afford to eat organic. Thankfully, “big box” and bargain wholesale stores, like Costco, have started selling organic foods for affordable prices! I’m here today to tell you about the pantry essentials that I buy at Costco. Most of them are organic, but for the few that aren’t, I will explain why I buy them anyway. I hope this list will help you to stock your pantry with high-quality organic essentials without breaking the bank! Please note that price and availability may vary by store. 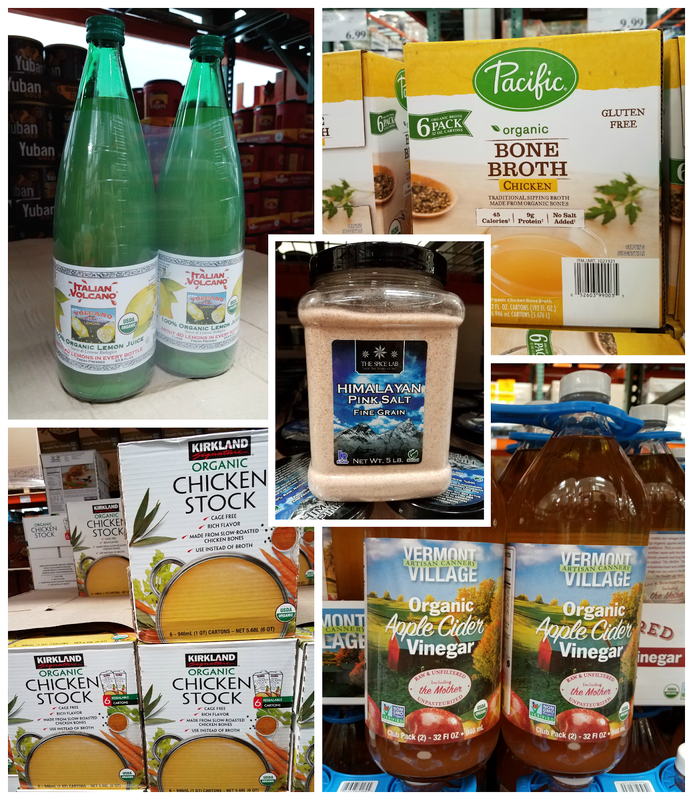 There are a lot of great bargains in this category, almost all of them organic and all found at prices that will save you a lot of money! The only product that isn’t organic is the Himalayan sea salt. Since salt is a mineral, not an agricultural product, there is no organic label and no such thing as “organic salt”. Having proper cooking oils is essential. I tend to favor monounsaturated oils, like olive and avocado oil, over polyunsaturated oils, like vegetable oil. The only oil on this list that isn’t organic is the avocado oil. I buy this avocado oil by Chosen Foods anyways for a couple of reasons: 1) avocados are not known for being highly contaminated with pesticides, and 2) this brand of avocado oil is certified GMO-free. Avocado oil is typically pretty pricey, so $10 for a 34 oz bottle is a steal! The olive oil and coconut oil is also bargain priced. There only two things in this category that aren’t organic: honey and almond flour. I’m not concerned that the honey is not organic because it is so difficult for honey to earn the organic certification. The surroundings must be controlled to make sure the bees are only visiting organic plants and the end product must be tested to ensure that there are no chemical or antibiotic residues (source). You can imagine how difficult it is to control tiny flying insects and other variables like wind! This is why organic honey is very expensive and simply not worth it to me. The other product on this list that isn’t organic is almond flour. I admit that I’d rather buy organic almond flour because a lot of pesticides are used on conventional almond farms. Logic would suggest that the shell around the almond offers the nut inside significant protection, but there is very little research to confirm this (source). 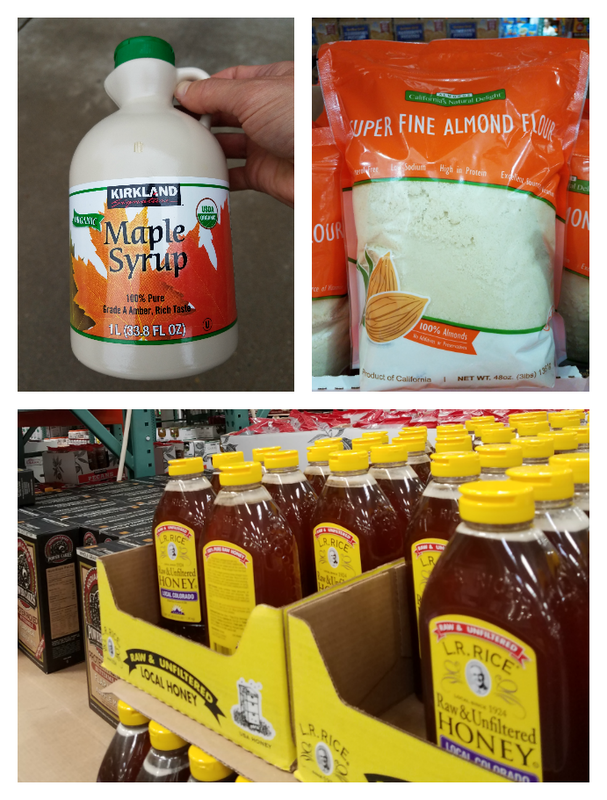 I suppose I am crossing my fingers and hoping that is true, because organic almond flour is so much more expensive that I can’t pass up this fabulous deal on almond flour at Costco! 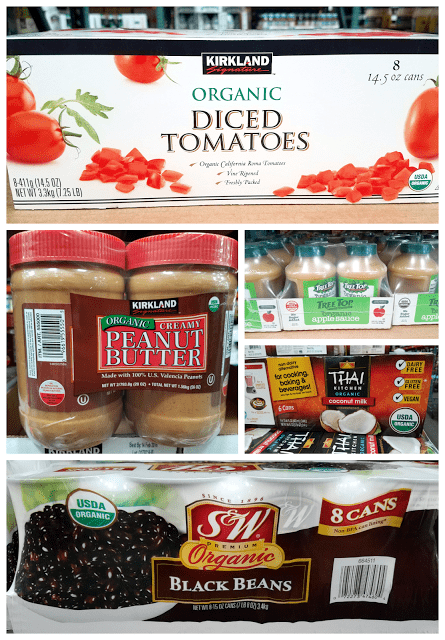 Organic canned tomato products are not the only things on this list that are a screaming deal, the organic applesauce, peanut butter, and coconut milk are, too! There are lots of great deals in this category! The non-dairy milks are the non-refrigerated versions in packaging that allows them to be stored at room temperature. A well stocked-pantry is essential to any home cook, especially a home cook striving to make delicious and nutritious meals for special diets like gluten-free, low-carb, Paleo or vegan! I don’t fulfill all of my pantry needs at Costco, but I have found some great deals that I have come to rely on. 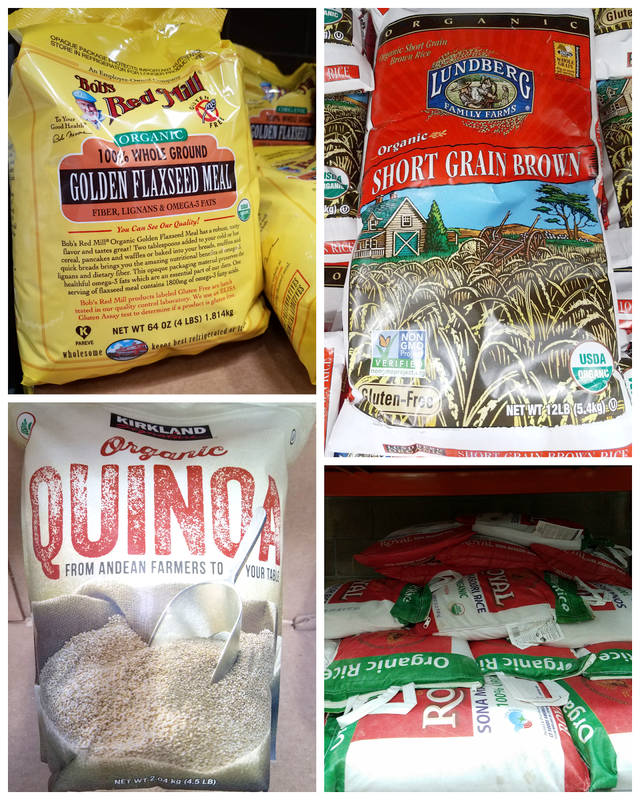 I hope that by sharing this list, I have helped you realize that you can stock your pantry with organic essentials without breaking your budget. Questions or comments? Please feel free to leave them below!